Collins offers the readers/viewers “a terrible kind of mirror,” according to Jennifer Lawrence, who plays the teenage leading role, Katniss. “This is what our society could be like if we become desensitized to trauma and to each other’s pain,” said Lawrence. The book/movie tackles subjects like totalitarian government, invasive media and dehumanization. The post-apocalyptic society remaining in North America has been divided into 12 districts. 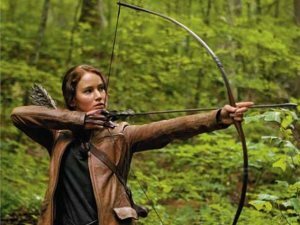 A failed revolution by dissidents resulted in the creation of the Hunger Games, used by the Capitol to suppress future uprisings and to entertain the “true citizens.” A teenage boy and girl are selected by lottery from each district for the televised reality show. The object of the game? Survival – of a different form than the current reality series, Survivor. The 24 teens enter a forest where they must kill the other contestants. Only the last survivor wins the lifetime supply of food and privileges. The producers, at the wishes of governing authorities, can randomly inject complexities into the game with some ability to manipulate the outcome. Some contestants train for years with the hope of selection. Katniss has learned her survival skills in her own reality of poverty. Her father has died and her mother has withdrawn mentally, leaving Katniss to fend for herself and younger sister. She hunts illegally in the woods outside her district’s perimeter just to put food on the table. Names in the lottery are duplicated based on how many times they have had to appeal for government food subsidies. When Katniss’ sister, whose name appeared on only one slip of paper, is chosen, Katniss offers herself as a substitute. That courage and passion prove vital to her success in the game. The Capitol has its roots in ancient Rome, where gladiators trained for regular arena combat for the entertainment of Roman citizens. The barbaric nature of watching warriors fight wild beasts or one another to the death defies any sensibility of a civilized society. A voyeuristic thirst for violence betrays a corruption of the human soul. 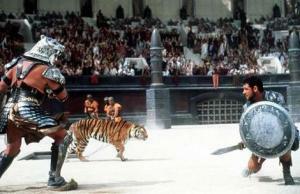 The modern Ultimate Fighting Championship (UFC) presents a tamer form of the Coliseum games. Trained in mixed martial arts, contestants engage in brutal unarmed combat. Watching one human beat another human senseless has become highly popular – and lucrative. How does this affect a society’s capacity for compassion and charity? On a different front, one has to wonder what attracts audiences to so-called reality television. Manipulation and tawdry theatrics bleed through the contrived productions of many series. What kind of desperation leads a person to watch 25 women compete for the love of one man (The Bachelor)? What is entertaining about adults lying and deceiving one another in a remote location, in order to get contestants voted off (Survivor)? Isn’t American politics adequate? 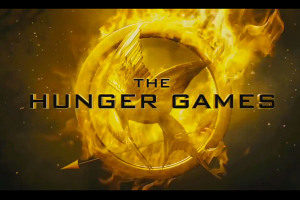 The Hunger Games presents violence and death for what it really is: a curse on the human race. On one hand, we must learn to accept death as part of the natural cycle of life. The narrative of every creature’s earthly existence concludes with “The End.” On the other hand, our souls protest this unnatural cessation of life. Something horribly wrong infects the narrative. Although we can learn to accept death as the way things are, we can never convince ourselves that it is the way things should be. While humans are capable of violent behavior, this capacity seems more like a rabid virus unleashed in the human soul. Social laws punish the inhuman nature of harming another person or animal, even when it is unintentional. Yet, violent video games and movies gross billions of dollars every year, feeding on some repressed drive. As a boy, I trained as a boxer at a local Boys Club. I competed for five years in the ring. One of my best memories as a teenager was sitting ringside with my dad at the Golden Gloves. But I never could get beyond that sickening feeling when I saw a boxer staggering on the canvass, battered and bleeding, a target for that final blow to the head. The Hunger Games wants us to feel that horrifying revulsion of violence, that nauseating response to violent death, that heightened sensibility to the alien presence of these enemies of life. Although Collins may not be offering a religious answer to this subject, she certainly raises the questions for a religious discussion. This entry was posted in Death, Movies, Violence and tagged Hunger Games, Survivor, Teen literature, The Bachelor, Ultimate Fighting Championship, violence. Bookmark the permalink.